The police’s Special Organised Crime Unit (SOCU) yesterday detained a Beechcraft BE 58 aircraft, with registration number YV 2377, after it landed at the Eugene F. Correia International Airport. Also detained was a Guyanese who is living in Venezuela. The flight originated from the town of Puerto Ordaz. According to reports, the SOCU is investigating allegations of money laundering. Kaieteur News was told that the plane reportedly landed at the Ogle airport, East Coast Demerara, around the mid-morning period. Roraima Airways provided the ground handling services for the plane. 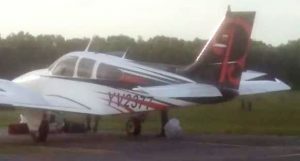 The Guyanese man, who owned the plane, was said to have been living in the neighbouring Spanish-speaking country of Venezuela for several years. There were no immediate details of anyone else being held. SOCU’s head, Assistant Commissioner Sydney James, was unwilling to delve into details except confirming that one person was detained and that an aircraft was at the airport with an active investigation ongoing. Meanwhile, the same unit reportedly seized cash on Tuesday in Region Nine. According to well-placed sources, the raid was conducted at a property in Lethem. It reportedly belongs to a miner. During a search, SOCU officials confiscated more than 20 ounces of gold, about 50,000 in Brazilian currency and $1.2M in local dollars.